Chernihiv: the city of hills and Orthodox churches | See you in Ukraine! The first thing that catches the eye when you drive towards Chernihiv along Kyiv Highway is the golden-domed churches perched on high hills. The Boldyni (Bolda’s) Hills are Chernihiv’s main landmark. 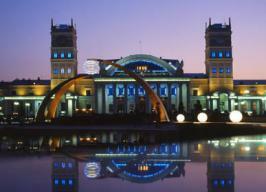 This city, one of the most famous in Ukraine, is almost 14 centuries old. In the agreement signed in 907 between Prince Oleh and the Byzantine Empire, Chernihiv is mentioned as the state’s second most important city after Kyiv. For quite a while, these two largest cultural centers of Kyiv Rus were rivals. Chernihiv does not yield to Kyiv either in the number, or beauty, or age of its architectural ensembles. Nearly a fourth part of all Ukrainian architectural monuments built before the Mongol invasion are in Chernihiv, the former center of the Chernihiv and Sivershchyna lands. Like every ancient city, Chernihiv has its own mysteries and legends, the first being its name. For a long time, the origin of the name “Chernihiv” was associated with the name of the legendary Prince Chorny (“Black Prince”), who was allegedly buried in the Chorna Mohyla (“Black Grave”) burial mound that stills sits on top of the Boldyni Hills and is one of the pre-Christian necropolis hills. The most romantic theory is that the city was named after Prince Chorny’s daughter, Princess Chorna (“Black Princess”), whose beauty caught the lustful eyes of a Polovtsian king, whose army laid siege to the city. The Boldyni Hills are crowned with the Troyitsko-Illinsky (Trinity-St. Elijah) Monastery, one of the oldest monasteries in Rus. The biggest mystery of this monastery is Antony’s caves. They were founded back in 1069 by the monk Antony, who was also the founder of the Kyivo-Pecherska Lavra (Cave Monastery). It is an entire underground city with cells, a necropolis and underground churches. The Chernihiv caves also impress researchers and visitors with their size. The largest of the underground churches, Feodosiy Totemsky’s Church, is over eight meters high and is crowned with a dome. When you get inside this church, you completely forget that you are underground. Another one of Chernihiv’s historic sites is the Val (“Mound”). The Val itself has not survived to our days, and the place where the Chernihiv stronghold once stood surrounded by high walls is now bordered by an alley with a fascinating panorama of the city. The Val is crowned by the Spaso-Preobrazhensky (Savior Transfiguration) Cathedral (11-th century), the oldest remaining cathedral in Rus, and the Boryso-Glibsky (Borys and Glib) Cathedral (12-th century). It is a single temple virtually completely reconstructed in its original form. It is decorated with a jewelry masterpiece – a gilded silver iconostas. It was cast from a pagan god’s silver statue. Another ancient monastery, the Yeletsky Uspensky (Assumption) Monastery (11-th century), is nestled between the Chernihiv stronghold and the Boldyni Hills. Together with the Troyitsko-Illinsky (Trinity-St. Elijah) Monastery and the Spaso-Preobrazhensky (Savior Transfiguration) Cathedral towering over the Desna River, it forms a breathtaking panorama of the old Chernihiv. The city holds a wealth of mysteries that can only be solved through visiting.